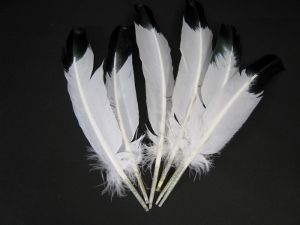 These imitation eagle feathers are white turkey feathers with their tips dyed black. The feathers come with a mix of left and right wing feathers, and are approximately 10" to 12" long. They can be used for home decor, arts & crafts, and smudging. They are sold in packs of 6. There are 3 left and 3 right wing feathers per 6-pack. Genus and species: Meleagris gallopavo. Ranch. Turkeys are not endangered and are not subject to CITES controls.